Uncertainty ~ times of unpredictability and danger. That about sums up hurricane season each and every year in the Fort Lauderdale area. Weather forecasting has improved immeasurably over the course of the last decade; however, tropical storms and hurricanes remain risky and precarious. Even with improved forecasting, if a storm is headed your way, preparation in securing your property can be utterly exhausting work! Fort Lauderdale residents and businesses that are located within the evacuation zones have additional worries with threatening hurricanes. Securing your property against the pending storm in a timely manner is critical to allow for adequate time to evacuate inland. Hurricane Shutters Florida can ease that burden and anxiety of storm preparation with their roll-down hurricane shutters! 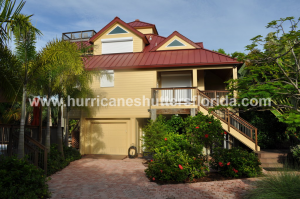 Headquartered in South Florida, Hurricane Shutters Florida provides Fort Lauderdale residents a superior product to protect their property and life against Mother Nature’s rage. The roll-down shutters from Hurricane Shutters Florida are constructed of the finest grade of aluminum for maximum impact resistance and durability. The sleek European-styled roll-down shutters are custom designed and engineered to fit each opening. The roll-down shutters are simple to implement with a smooth, manual crank or an upgraded fully synchronized electric motor drive for maintenance-free operation. Precise metal workmanship utilizing innovative technologies provides homeowners and businesses added value with significant energy savings and increased privacy and noise reduction, not to mention reduced homeowners’ insurance and increased resell value of their home! You can count on the finest products available on the market – Hurricane Shutters Florida’s roll-down shutters meet the most stringent wind codes in the country! These top quality roll-down shutters have been reviewed and accepted by the Miami-Dade County Product Control Division, Florida Building Code, and the International Building Code – which is without question, some of the most rigorous building code in the world. Now is the time to invest in protecting your property and safe guarding your life against hurricanes and tropical storms that are becoming all too common in South Florida with the finest quality roll-down hurricane shutters! Don’t procrastinate until summer rolls around and then wish you had the needed protection for your Fort Lauderdale home or business. Buy roll-down shutters that are the ultimate in performance and beauty directly from our factory and save! We are the hurricane shutter manufacturer so we can offer the lowest prices on the best quality hurricane protection and security shutters you can find online and we offer installation to our South Florida customers as well. Contact Us Today for a FREE Roll-down Hurricane Shutter Quote at our South Florida Headquarters: (954)474-3557. This entry was posted on Tuesday, January 22nd, 2019 at 8:46 pm	and is filed under Decorative Shutters, Hurricane Shutters, Rolling Shutters, Security Shutters, Storm Shutters. You can follow any responses to this entry through the RSS 2.0 feed. Both comments and pings are currently closed.